The most famous Italian Christmas Panettone cake made with sourdough (lievitomadre) and ingredients of first choice. 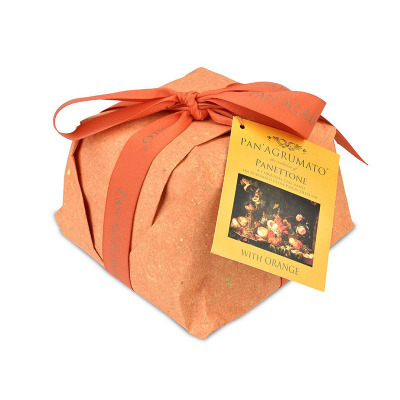 This is a top-quality panettone without butter, lactose and milk derivates: it is replaced with Agrumato olive oil. Because of these reasons, Pan'agrumato is highly digestive and has a low cholesterol content. Very innovative product by the Ricci family. They were the first ever to use citrus fruits in combination with the oils. So that, they created the name "Agrumato" to define the range of various condiments. Their tastes give us a jubilation of sensation and a healthy sensation. Pan'Agrumato with Orange is realized substituting the butter with the Agrumato Extra Virgin Oils. This is a very original dessert, delicious and soft with an inimitable taste. The fragrances of the citrus fruits, the oil and of the raisins create a top quality Christmas cake. INGREDIENTS: WHEAT flour, raisins, EGGS, natural yeast (WHEAT), Sicily candied orange peels 10,50%, (orange peels, glucose- fructose syrup, sugar), extra virgin olive oil orange citrus 8%, sugar, orange paste 4%, (orange peel, glucose- fructose syrup, sugar), EGG yolk, emulsifiers: mono and diglycerides of fatty acids of vegetable origin, OAT fiber, salt, natural flavourings. DOES NOT CONTAIN PALM OIL. ALLERGENIC ADDITIVES - CONTAINS: wheat flour (gluten), natural yeast (gluten), egg yolk (eggs), eggs, whole wheat flour (gluten), May contain traces of ALMONDS, HAZELNUTS, PISTACHIOS and SOYA.